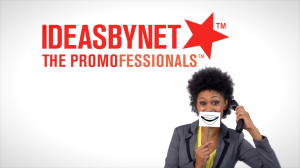 The guys at IdeasBynet are always asking me for something a little out of the ordinary. 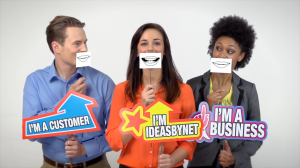 This time we were making a TV commercial to promote their rebrand, something fresh and fun with loads of character. This was shot in their photo studio, lit with two 1.2kw MSRs through my diffuser frames and Dedos as backlighting. The performers were two staff members and one semi-pro actress. They were holding sticks with cardboard sheet and tracking markers drawn on. The shoot was fairly simple, the only difficulty was ensuring that the actors didn’t move their mouths too much behind the cardboard and that they didn’t turn their heads too much or their mouths would be visible. -Get the voice performances edited and signed off by the client. -Edit the actor’s background footage to match the voice recording. -Save each dialogue line as individual Quicktime files. 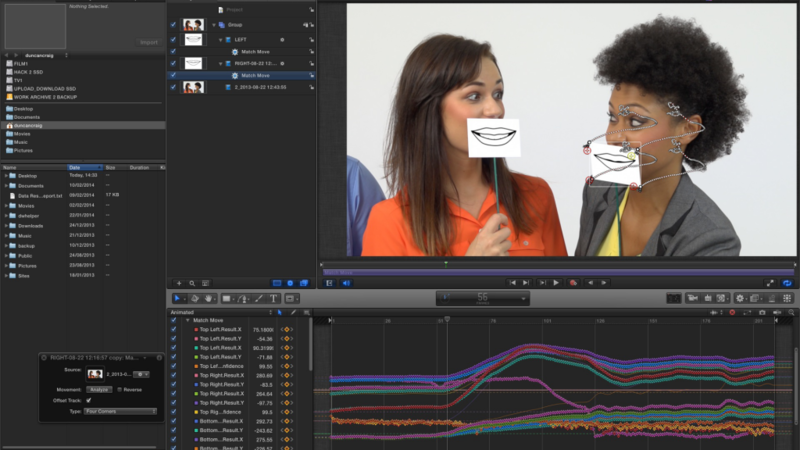 -Motion track the individual mouths for each file. -Edit the mouth movement images to match the voice recording. -Apply the mouth images edits with the motion tracking to the ordinal background files. -Put it all back together in Final Cut Pro. -Apply colour corrections, add strobing/weaving effect.